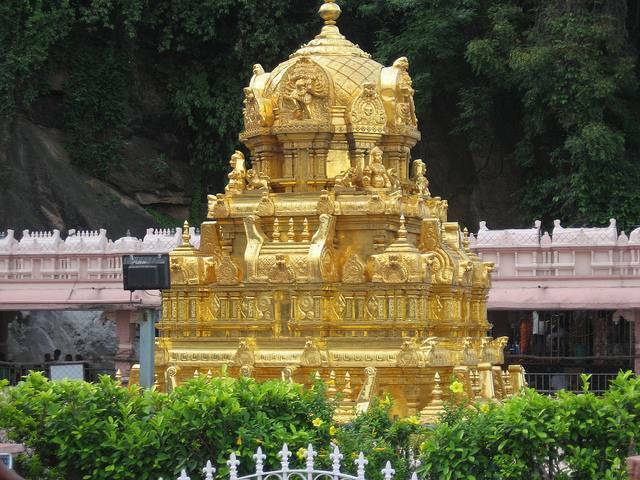 Kanaga Durga Temple, which is described in Vedic literatures like Kaalika Purana, Durga Spathashati etc is the major pilgrim center in Vijayawada. The temple stands majestically over the Indrakeeladri Hillock on the banks of River Krishna. Main Deity Kanaga Durga (Goddess Parvati) is worshipped in the form of Swayambhu in Triteeya Kalpa. As per Hindu Mythology, once there was a Demon King Mahishasur who ill-treated the native people. So Sage Indrakeela meditated sincerely towards Goddess Durga. Moved by his penance, Goddess came down and blessed the sage. Then the sage asked her to destruct the demon and save the innocent people by residing on his head. She did so and made Indrakeela as permanent abode. King Arjuna constructed a temple for Goddess Durga after receiving the Pasupathaastra from Lord Shiva by performing a penance. The temple has many inscriptions belonging to various dynasties. Beside the temple, there is a small temple for Lord Malleswara Swamy. In sanctum sanctorum, the Goddess statue stands over the demon king with all her eight hands winged in air holding different weapons.